With the recent corporate scandals in Nigeria largely blamed on weak corporate governance, the codified efforts on minimum requirements have gradually shifted from a persuasive document to a binding code, especially on Listed Companies like ours. Indeed, effective 4th April, 2011 all Listed Companies are mandated to comply with the SEC Code of Corporate Governance. This Code defines the minimum standards of corporate behaviour on issues pertaining to the Board/Board Committees, Investors/Stakeholders relations, Risk Management and Audit, Accountability and Reporting. The Company has within the financial year significantly enthroned the principles of good corporate governance in its people, policies, processes and structures. Our report presents our efforts at maintaining the best global practices on corporate governance in line with codified standards. ASO's 9 man Board is composed in a manner that guarantees competence, diverse experience and objectivity. Comprising, a healthy mix of Executive and Non-Executive Directors, the Board is headed by a Chairman, who is a non-Executive Director, and who steers the Board's proceedings towards achievement of the Company's strategic objectives. A Managing Director/Chief Executive Officer on the other hand heads the management team and directs the day to day operations of the Company. With the steady expansion in business and operations, it became pertinent to increase the Board composition to ensure it maintains effective oversight functions. To this end, the Company has secured the requisite approvals for an increase in the maximum board composition to 15 Directors. The Company is also in the process of appointment of two independent Directors, to improve the independence and objectivity of the Board in its deliberations and decisions. The Board is primarily responsible for ensuring good corporate governance in the Company, as well as defining the Company's strategic goals and ensuring that its resources are fully deployed towards the attainment of these goals. Effective oversight on the general activities of the Management team, including their appointment, compensation and discipline. While undertaking these functions, the Board has been assisted by several Board Committees. The Bank presently has 4 Board Committees which assists the Board in discharging its functions; Audit Committee, Board Risk Management and Investment Committee, Board Credit Committee and Board Compensation Committee. The composition of these Committees effectively considers the requisite skills and competencies of their respective mandates. Relevant Senior Management staff are also permitted to be in attendance in deserving circumstances to assist the deliberations of the Committees. The Audit Committee is comprised of 6 (six) members, comprising a mix of Executive and Non-Executive Directors as well as seasoned professionals duly elected by the Shareholders. To further ensure independence, the Committee is chaired by a Shareholder-nominated member. Maintaining a constructive dialogue between the Joint External Auditors and the Board in order to ensure that the credibility of financial disclosures and the interest of Shareholders are enhanced. Overseeing the activities of management with regard to the investment of the Bank's funds. Review of credit risk reports submitted for its consideration. Diligently executed its mandate per other matters assigned by the Board. In the discharge of its functions, the Board and Board Committees have met regularly to deliberate and take decisions on issues within their respective mandates. These meetings have recorded high attendances with few cogently explained absences. To further ensure diligence and accountability, the Board members were within the year subjected to a formal and rigorous performance evaluation. The evaluation was based on set key criteria and was conducted by a renowned independent consulting firm. It extensively assessed the Board's skills and competency level, commitment and integrity amongst others. The Company has demonstrated a deep appreciation for periodic, relevant, professional continuing education programmes in a bid to update the Directors and Committee members' knowledge and skills and keep them abreast of development in the Company's operating and business environment. To this end, the Company has within the year sponsored the Board and Board Committee members to various cognate trainings within and outside the country. ASO recognises that superior stakeholder satisfaction is critical for successful companies in a hyper competitive environment. These stakeholders are acknowledged as those, whose without continuing participation, the organization cannot survive as a going concern. They include the shareholders or owners, employees, customers, suppliers, the Government and the community. Generally, the Company conscientiously seeks to understand stakeholder needs and adopts transparency, open communication, fairness and superior value proposition in ensuring stakeholder-satisfaction. The shareholders have been fairly treated, given equal access to information and availed full voting and participatory rights in the General Meetings of the Company. The Company maintains a shareholders' help desk manned by dedicated and well trained relationship managers for an effective resolution of shareholders enquiries and issues. The Company has also met with its reporting and disclosure requirements in an accurate and timely manner. ASO respects the personalities and individuality of employees, and consistently provides employees with safe conditions of work and good terms of service, promoting staff development and encouraging full participation. The Bank has also strived to keep staff motivation at the peak through review of compensation plans as well as revised staff mortgage and reward policies. The customers have also been availed with products and services that offer value in terms of pricing and quality. To ensure we deliver first class services to our customers, the Company is currently implementing a service culture plan in partnership with a seasoned US based consulting firm. The use of mystery shopping as well as strengthening of the Company's Service Quality Unit has further ensured we offer highly competitive services. A customer forum was also successfully held within the year where our customers were availed the opportunity to participate in the corporate decision making process. The Company has maintained a mutually beneficially relationship with its suppliers, discharged its legal and regulatory obligations in a timely and efficient manner as well as carried out its business in line with the best ethical standards and tenets of sound Corporate Social Responsibility (CSR). Historically, Risk Management is focused on managing financial risks through insurance along with managing operational risks such as environmental, health and safety. Risk management focused on protecting enterprise value and achieving functional excellence. As globalization intensified, the speed of business increased, and regulatory regimes became more stringent with increased policies, business became increasingly complex and more risks emerged. Recent changes in the regulatory environment including the release of new banking guidelines for Primary Mortgage Banks and business growth, have necessitated the adoption of a more proactive approach to risk management as ASO believes sustainable growth is anchored on first class risk management. Risk management is the core driver of our business and is reflected in every decision and action we take. We use it to create and uphold value for our stakeholders and differentiate ourselves in the market place by being the benchmark for our peers and the reference for all businesses. ASO adopts a cautious, calculated and responsible approach to risk taking and continuously evaluates the risks and rewards inherent in all its business transactions. We only undertake transactions that we consider prudent and within our risk appetite. Our risk culture empowers our people to make informed decisions in managing rather than avoiding risk by creating a balance between risk and rewards. ASO's risk appetite is expressed in terms of the level of variability of return it is prepared to accept in order to achieve a desired level of result. It is determined by considering the relationship between risk and return. Our risk appetite shall always be set at a level that minimizes erosion of earnings or capital due to avoidable losses in our mortgage transactions and/or from frauds and operational inefficiencies. The Board of Directors has overall responsibility for the establishment and oversight of the Bank's risk Management framework via its committees' Board Risk and Investment Committee, Board Credit Committee, and Board Audit Committee. These committees are responsible for developing and monitoring risk policies in their specified areas and report regularly to the Board of Directors on their activities. Mortgage lending is the principal business activity for ASO. The loan portfolio is typically the largest asset and predominant source of revenue. As such, it is the greatest source of risk to the Bank's safety and soundness. The department consists of the Portfolio Planning & Risk Reporting, Credit Analysis, Credit Admin & Processing units, and together they implement credit policies and procedures in line with credit approval authorities granted by the Board. The credit risk management unit is responsible for monitoring the quality and performance of its credit portfolio and for controlling credit risks in its portfolio. During the financial year, we have continued to focus on enhancing our capabilities in providing both qualitative and quantitative data to the board on risks associated with credits and facilitating more informed and effective decision making. Our lending criteria for all lending products have further been strengthened during the year while collection and recovery processes enhanced. This is evidenced by a significant reduction in the volume of our NPL. Operational risks arise as a result of inadequate or failed internal processes, people, and systems or from external events. When these risks crystallize, they result in operational losses such as legal costs and liabilities, interest claims, penalties and fines paid to regulators, losses or damage to assets, and write downs on financial assets. The operational risk team through risk identification and assessments, measurement and monitoring reduces the likelihood of occurrence of risk events and their impact on the Bank's bottom line. Operational risk management tools such as risk and control self assessments and incident management and reporting have been deployed in identifying new risks and adverse trends bank wide, thereby improving operational capabilities. ASO is also the first Mortgage Bank in Nigeria to institute a loss data capturing system in efforts towards Basel compliant. During the year, ASO strengthened its regulatory reporting capabilities by deploying an automated anti-money laundering solution for reporting currency and suspicious transactions to the regulators. To further create a compliant environment, the Compliance Team commenced training of new staff on regulatory compliance as part of their induction programme. Trainings covered topics such as Know Your Customer (KYC), Politically Exposed Persons (PEPs) and Due Diligence. It is worth mentioning that no regulatory infringement was reported during the period and as such no penalty, sanction or fine was incurred by the Bank. This unit has the responsibility of ensuring that ASO's risk assets are adequately collateralized and that real estate construction projects are delivered within cost/budget and timelines, and according to scope and specification. The unit conducts field assessments and site inspections and produces valuation reports which form the basis for the consideration of collaterals and loan disbursements. A proposed Project Management Unit will help in manage the risks inherent in large real estate projects. In its bid to contain construction risk the real estate risk management unit assesses developers' ability to commence and complete the project within budgeted time budgeted costs. The unit also assesses the ability of the developers to deliver houses of requisite quality. Their ability to ensure that changes in prices of materials, labour and land acquisition are not adverse reduce the chances of projects being abandoned by developers. This unit also manages risks in property exposure via valuations and appraisal assessments to ascertain the appropriateness of properties as collaterals and their ability to be easily converted to cash in the event of default by a customer. The forced sale value of a property must be able to cover the bank's exposure. Hence, the need for a thorough evaluation and assessment to guarantee that all risks inherent are adequately taken into consideration. ASO Savings like any other financial institution has set up the remedial management unit with the mandate to reduce to the barest minimum, the rate of nonperforming loans in the Bank. In recent past, the Bank was overburdened with a huge volume of nonperforming loans which significantly impaired the Bank's earnings and shareholder value. The establishment of this unit has contributed in moving the Bank from a negative to positive position in terms of profitability. Aggressive recovery using well experienced recovery agents, robust remedial techniques and a hard line posture on defaulters yielded great results. The IT Risk Management department consists of IT Risk Assessment and Monitoring which is responsible for IT risk assessment over IT and business processes, IT applications and supporting infrastructure; the System Control unit responsible for user access management and ATM PINs management; the CBA/Revenue Assurance unit responsible for periodic review of controls over the core banking application and over system processing of automated transactions such as revenue; the Information Security, Business Continuity and Crisis Management responsible for ensuring that infrastructure threats and vulnerabilities are identified and managed and that the disaster recovery plan and business continuity plan are updated and tested on a regular basis. 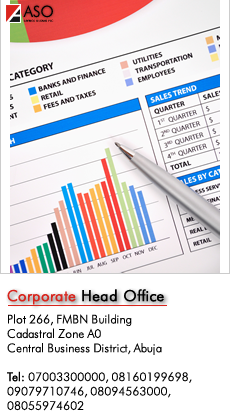 The unit is responsible for ensuring compliance with the Bank's policies and standard operating procedures. The internal control process is designed to provide reasonable assurance regarding the effectiveness and efficiency of operations and the controls around them, the reliability of financial reporting, and compliance with applicable laws and regulations. The unit has adopted COSO internal control framework as the approach towards achieving control objectives. Service quality management (SQM) is a vital ingredient in ASO's ability to maintain profitability and continued success in business. Not only does Service Quality build loyalty for both ASO and its products, it guarantees ASO's viability in today's competitive market. ASO has adopted an integrated approach to risk management where the audit, compliance, risk and governance functions are converged to a common objective. Risk assessments are integrated with strategy development and business planning, enabling management define soft spots, loss drivers and complexities inherent in the Bank's objectives which could adversely affect execution and performance. The Company's Audit structure revolves around the Internal Auditors, External Auditors and Audit Committee. The Company operates an effective risk based internal audit function wherein internal auditing activity is clearly defined and regulated by the audit charter duly approved by the Audit Committee and Board. Internal Audit Unit reports directly to the Board through the Board Audit Committee but nevertheless maintains a direct line of communication with the MD/CEO. Within the year, the Internal Audit has remitted monthly audit reports to the MD/CEO and quarterly audit reports to the Audit Committee. Exceptions raised in these reports have been treated with utmost significance and regularizations were strictly monitored and followed up. The Unit has further developed a whistle blowing mechanism for reporting illegal or unethical occurrences within the Company. The mechanism is accorded priority and the Board has reaffirmed its continual support and commitment to the process. The effectiveness of the Internal Audit Unit has also been largely enhanced by the recruitment of a very experienced and senior staff as the Chief Inspector. The staff strength was boosted by recruitment of experienced and highly qualified staff. Structural changes were also effected within the unit to maximise its effectiveness. Complementing the efforts of the Internal Audit efforts are the Joint External Auditors; Ernst & Young and Aminu Ibrahim & Co. To safeguard the integrity of the external audit process and guarantee independence, the External Auditors as a principle, neither hold shares nor any credit facility in the Company, whether directly or indirectly. These Audit firms constantly rotate audit partners assigned to undertake external audit of the company, further guaranteeing independence without compromising continuity of the external audit process. ASO observes full disclosures in line with the legal and regulatory requirements. It has within the year rendered accurate and timely reports within the relevant regulators and stakeholders. The Directors have also reaffirmed their ultimate responsibility for the corporate reporting system and continues to dictate measures geared towards improvement. The Company has in partnership with KPMG professional services been working towards a seamless adoption and conversion to the International Financial Reporting Standards (IFRS) as published by the International Accounting Standards Board (IASB) to guide the preparation of financial statements. The conversion process is in the conclusion phases and the new standard would be adopted in preparation of financial statements for the December 31, 2012 FYE as well as the succeeding financial years.